Katrine (Kat) graduated from the University of Birmingham in 2014. During university, she won the national GSK prize in Communication Skills and was short listed for the Charles Green Prize in Oral Surgery. 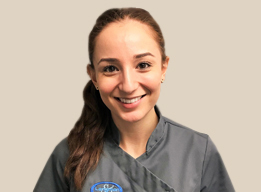 Kat has spent time branching out of practice and has worked within the Community Dental Services and for the Oral and Maxillofacial team at Queen Elizabeth Hospital, Birmingham. She has gained her Diploma of Membership of the Faculty of Dental Surgery of the Royal College of Surgeons of Edinburgh (MFDS RCS Ed) and is a member of the British Dental Association with role of secretary for Central Counties Branch. Kat joined Langmans in January 2019 and also works at a dental practice in Bromsgrove. She is thoroughly enjoying treating her diverse patient base. In her spare time, she enjoys painting, pilates and spending time with family and friends.